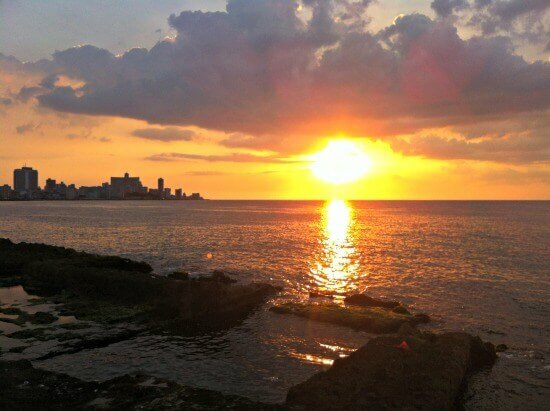 If you’re staying in the popular all-inclusive Varadero area of Cuba no doubt you’ll want to pop out for at least a day trip to Havana to see what all the fuss is about. 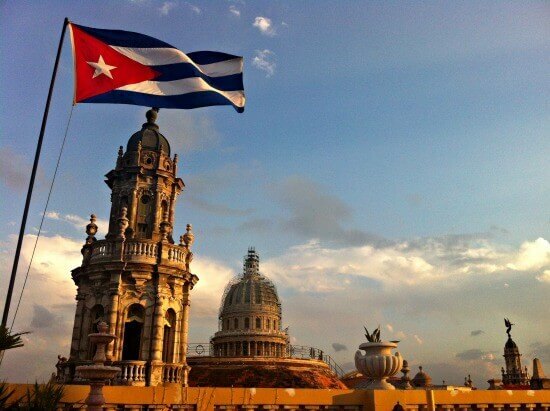 There are plenty of things to do in Cuba’s capital for super cheap, sometimes even free. I went to Cuba in May and had an awesome two weeks, with ten days of it in Havana. 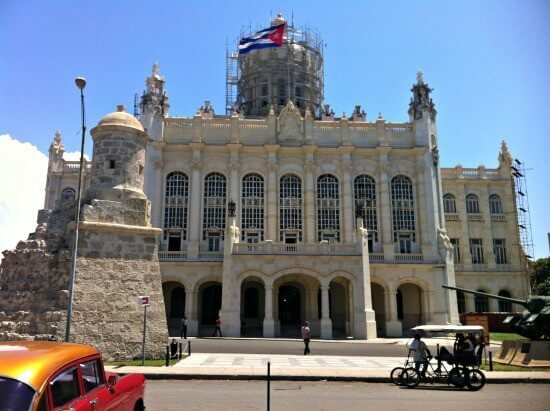 Being the bargain hunter I am, these are the best, most awesome and cheapest things to do in Havana in a day to keep the costs of travelling to Cuba down (press play above for your musical accompaniment to the list). 9am: Arrive in Havana and head straight to the Malecon. Take a slow walk to the Nacional Hotel up on the hill taking in the brilliant sea air as you do. 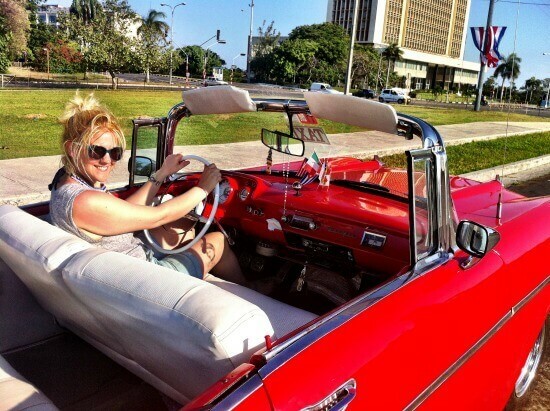 Note the awesome Cuban cars whizzing by – now you’re in Havana. Feel free to chat to anyone you meet along the way, but be careful not to get caught up in any ‘once in a lifetime’ deals. Stay focused on my itinerary, we’ve not got long. 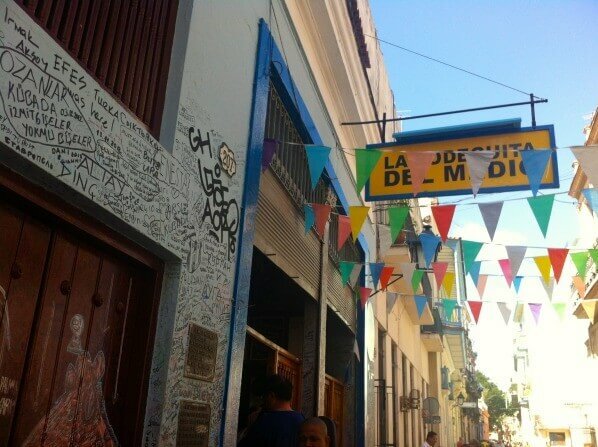 10am: Reach The Nacional and take a closer look at the cars out the front, which is round the back of this photo. Keep a mental note of your favourite style, we’ll come back to that later. Order an early morning Nacional daiquiri to refresh your palette from the walk and get into the spirit of Havana. Drink in The Nacional’s garden admiring the beautiful vistas out to sea. 11am: Choose your car out the front, a nice red Chevy? As you can see, that’s what I went for. You can get an hour’s Gran Car tour around the city past John Lennon’s park and stopping to admire Revolution Square to stretch your legs and have a go in the front seat. 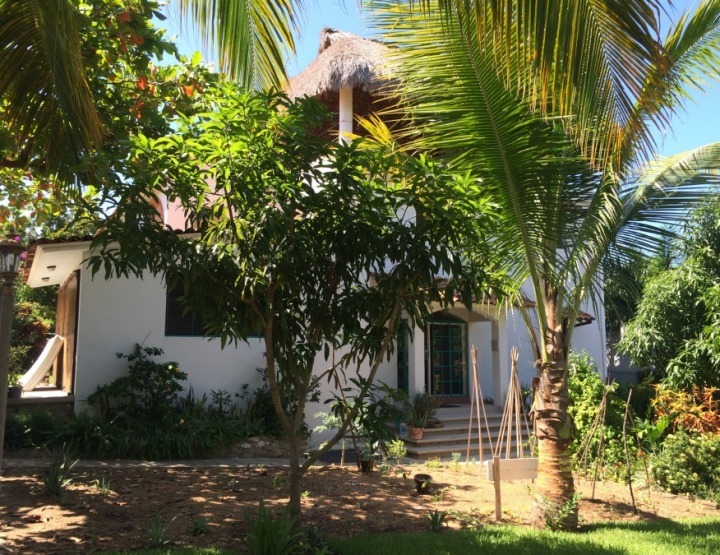 Get dropped off outside the Parque Central Hotel in the main square – perfect for a coffee on the rooftop, if you need. Noon: Take a walk around the Old Town. 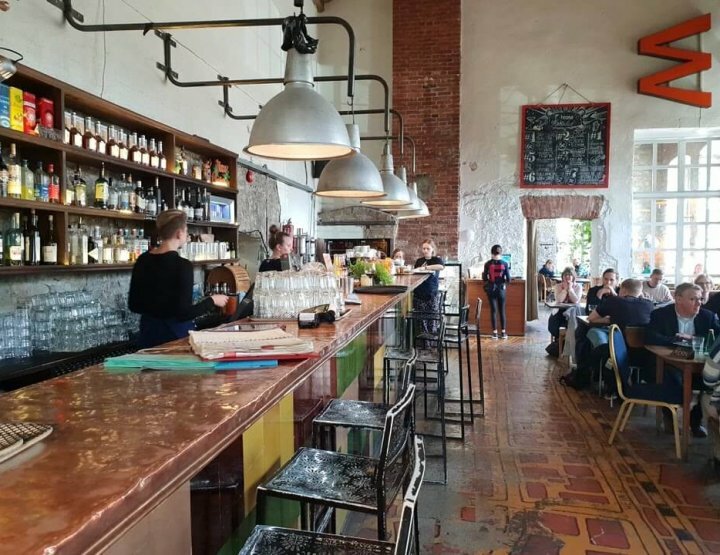 Get lost, take photos, listen to Cuban bands, drink coffee in Havana Vieja, buy Che memorabilia and get a bite to eat along Obrapia. Keep things cheap at the bar with the green front and crazy dancing (you’ll know it when you see it!) 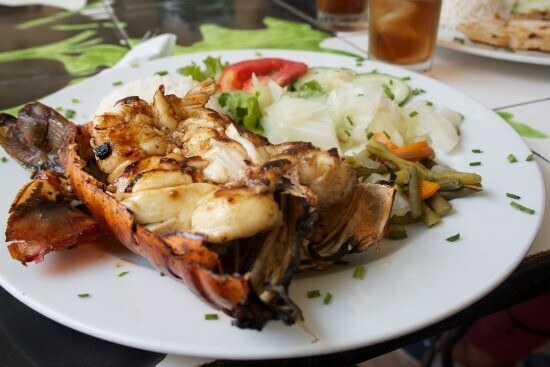 where you can get this lobster, a Mojito and a creme caramel dessert for just $10. 2pm: Go to the Museum of the Revolution to escape the sun for an hour or two and learn some more about Havana’s rich history. You’ll soon be able to cite a few facts about the Cuban Revolution, and take a look at the famous Granma Memorial to show the folks back home it wasn’t all sun, sea and Mojitos. My mojito in La Bodeguita, my daiquiri in El Floridita. He was also partial to Sloppy Joes, Hotel Seville and pretty much any bar around the city, if the local owners’ words are anything to go by! 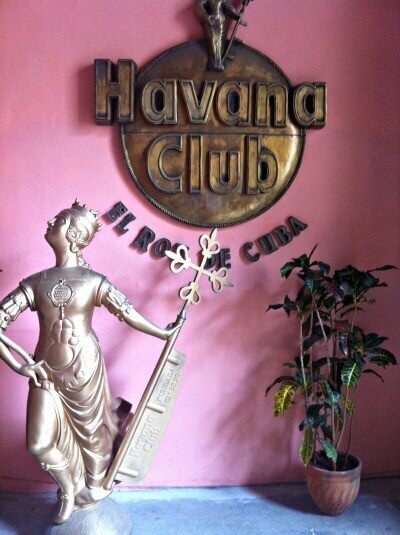 5pm Make your way to the Havana Club Museum on the seafront for a tour of one of Havana’s most famous exports. The other one, Partegas Cigars, are housed at the museum near the Capitol building – only open on the occasional Monday as we found out when we arrived on the Saturday. At the Havana Club Museum you’ll get a few shots on the way around and the chance to buy as much rum as you can carry home in the gift shop on the way out. It’s a fascinating look at how rum is made, and the important history it has to play in this little Caribbean island. 7pm Dinner time. You must be tired so hail a coco taxi – a yellow bubble you sit in attached to a moped – to take you back to the Hotel Inglaterra and take the lift up to the rooftop. The views are stunning, especially as the sun goes down. I can also vouch for the meat shish kebabs and chips, delicious. Oh and of course, a few cocktails to persuade it down until you’re picked up to go back to your resort. No worries Elly – let me know how you get on! What a great post and super resources. I love your photographs especially the woman with her Siamese cat. One of my friends recently returned from Cuba and he said that it was one place that he definitely wants to return to. There certainly is a attraction there. 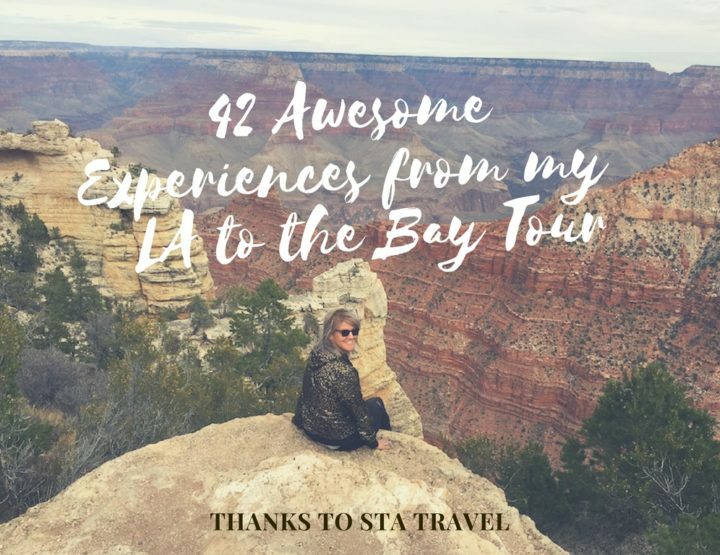 I also have my own travel blog and I wanted to share my Americas pages with you. Thank you and happy travels. Hello Charles, great to hear you like my photos. It was actually difficult to take a bad one in Havana, it's such a bright and picturesque place. I'd definitely love to go back some day. I'll check out your travel blog now! Thanks so much for this article Vicky. My husband and I recently went to Varadero for two weeks and used your article for our day in Havana. We had a brilliant time and pretty much followed it down to a tee! Hi Jill, unfortunately we didn't eat at any Paladares but we did eat in the casa particulars and everything was really good and tasty. Our trip from Havana to Trinidad was in perfect luxury on the coach and I'd definitely recommend travelling in that way. WOw!! this sounds like a great little itinerary, I'll be there for work and I have a day off.. thanks! Jill.. ALso I see you are going to Barcelona... you will have an amazing time! Hi Vicky my wife and i will be visiting Havana in November. Our ship docks in Havana on Friday 23rd at approx 1400hrs and remains there until the following day (1200hrs0. 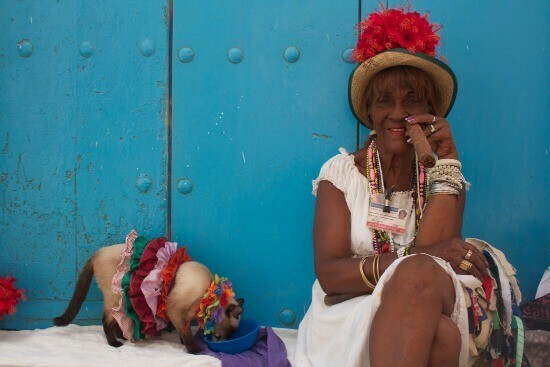 We intend to use your itinerary, however we wondered whether you could suggest were to go to after 2100hrs to capture some of the cuban atmosphere/culture. We were thinking of Tropicana but have read mixed reviews. Hi Barry, oh that's great to hear! You'll have a great time. 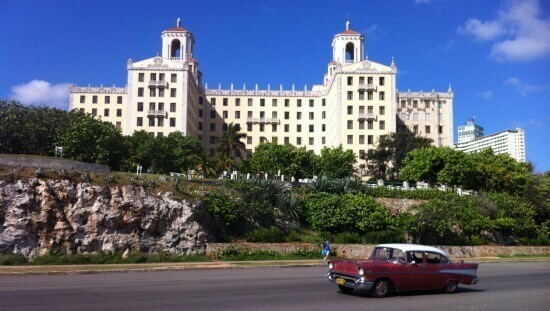 How about going to one of Havana's Paladares? They're like supper clubs in Cubans homes. You could go to one of those and then onto a bar for a Mojito. I think we just hung around the centre of Havana and went out. We didn't go to Tropicana so I'm afraid I can't advise on that one. Here are a few articles about the paladares. Ladies! 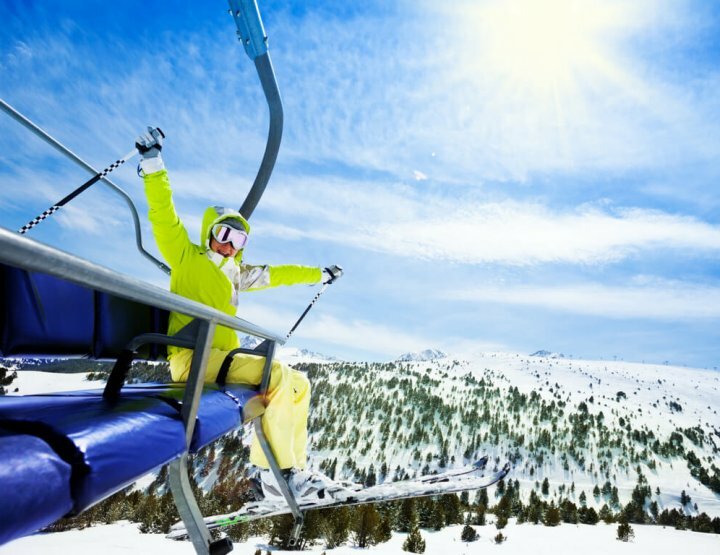 Ever Considered Becoming a Ski Instructor?